This design was submitted for consideration to the Nevada Governor's office in 2004. No action was taken on it, however. Nevada's unique Great Basin topography symbolizes the state's geologic importance. The famous Virginia & Truckee locomotive #18 (the "Dayton") served Nevada during the great gold & silver mining boom, and is reminiscent of the Silver State's "Wild, Wild West". The Dayton is on permanent display at the Nevada state railroad museum in Carson City. 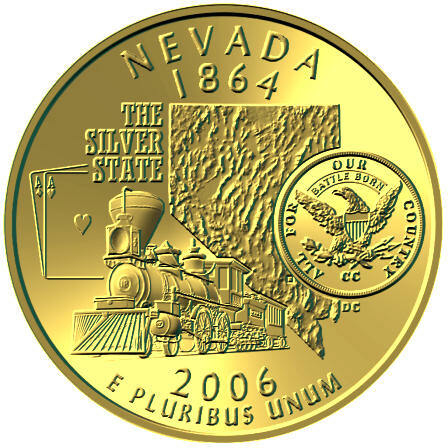 The coin image is patterned after coins once minted from Nevada gold and silver at the Carson City mint. It shows the state capitol's famous "CC" mint mark. The legends were changed to show the official Nevada state motto "All For Our Country" and "Battle Born". The pair of aces is representative of the state's gaming industry. The ace of diamonds symbolizes the glamour of Las Vegas, and the ace of hearts symbolizes the romance of Nevada. The small square on the map shows the location of the mysterious and legendary "Area 51".